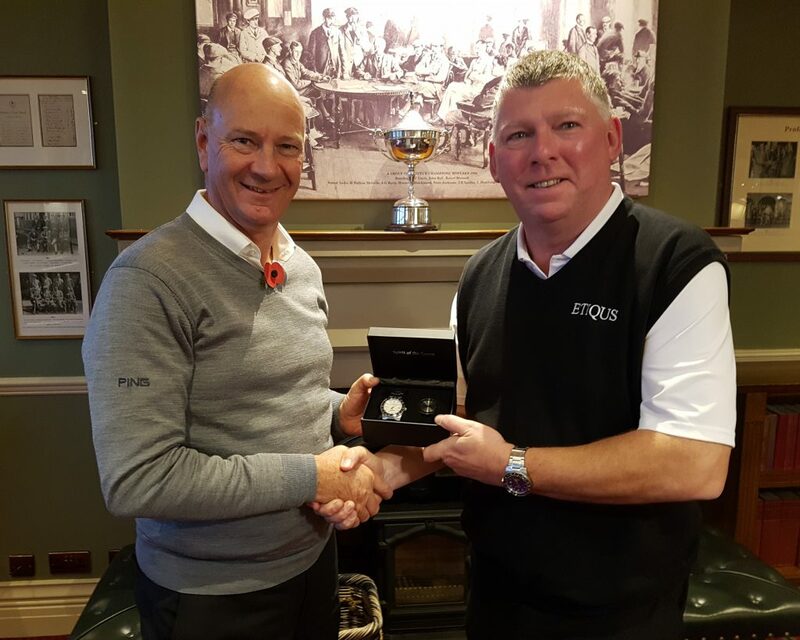 Rob Perkins Crowned 2018 AGW – ETIQUS Golfer Of The Year. Rob Perkins is the AGWs 2018 ETIQUS Golfer of the Year. Rob, who captured the Michael Williams Hogget at Delamere Forest a day earlier, stormed his way to an overall 47 point triumph at the conclusion to the AGW Golf Writers Championship at Royal Liverpool but in dropping his poorest score, and that being his 18 points at Royal Liverpool, the official winning margin is 29 points. Dave Facey (96 points) and Neil McLeman (92 points) had lead going into the Michael Williams Hogget but their inability to play the closing two events saw Rob take full advantage and come from third with 90 points to amass 35 in winning at Delamere Forest and then record 18 points in finishing fifth at Royal Liverpool. Rob had earlier scored 29 points in the Presidents Putter, 22 in the R & A Salver and 39 in finishing runner-up to Dave in the Ron Moseley at Royal Mid-Surrey. On hand at Royal Liverpool was ETIQUS’s Gary Bulter who was delighted to present Rob with his choice of a stunning ETIQUS wrist watch. A very special thank you to Gary not only for his continuing support of the AGW but also for the ‘golfing’ gifts he handed out to members before and after the day’s golf. Finally, thank you to all those members who made effort to support the golf outing and with Royal Liverpool assuring the AGW the multiple Open Championship venue is again happy to host the AGW in 2019.